This is a concept ive been workning on this past week hoping to get some c&c on it to see if these actually look good. I know some people dont like black on the lions as they perfer the more traditional look but i wanted to see what you guys had to say. 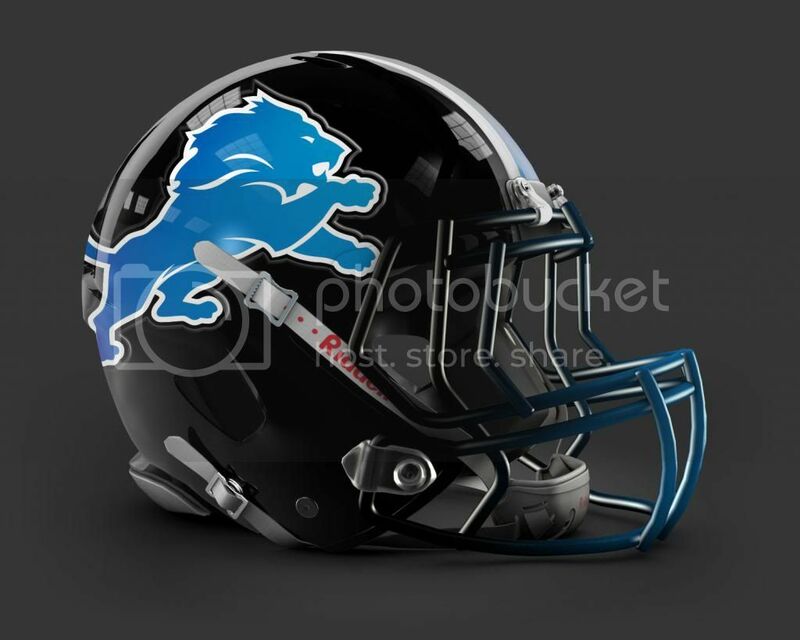 I went with a black helmet with gradient stripes. On the uniform i tried to get the numbers to look like the material the ducks use. The helmet is really cool! I especially like the blue on the facemask. Like this alot. Love the step-back striping... Try full blue facemask and a little more blue on the socks somewhere. Maybe accent the cleates instead. I like the black, I think black and blue is a very under appreciated color scheme in sports. I like the black helmet. When they had the black alt with the silver helmet it looked just like Carolina to me. The stripping is ok, its very modern and looks like something Nike would do, so in that regard it does seem realistic and very creative. I would use there current font over what you have now, and I am not a fan of the gradient on the stripping or the numbers. All in all this is very unique approach that I have never seen. I wouldnt be upset if they used these next season. not bad, helmet is striking. I like the striping on the jersey as well. What about going back pants with a hawaii blue top? Am i the only one who thinks the real lion unis have too much stripping on them? Creative, however I am not a fan of the number font.